The building started as a modular mid-rise passive house project, but the building size quickly demonstrated that conventional construction was more spatially efficient and cost effective. 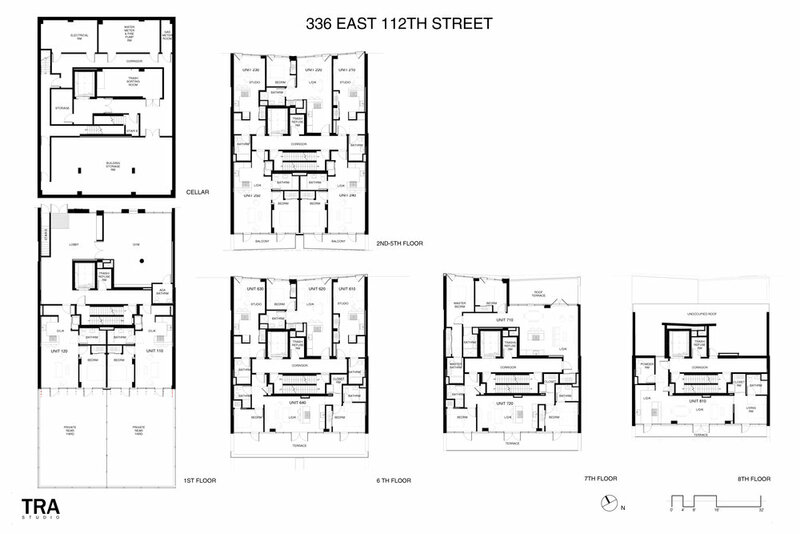 During the design process East Harlem quickly became “NYC’s next hot neighborhood” making the apartments morph from high density rental to comfortable condo units all with ample outdoor space and on-site amenities. The contextually fitting design, which informed initially the modular project, stood to the program transformations, shaping the current design. 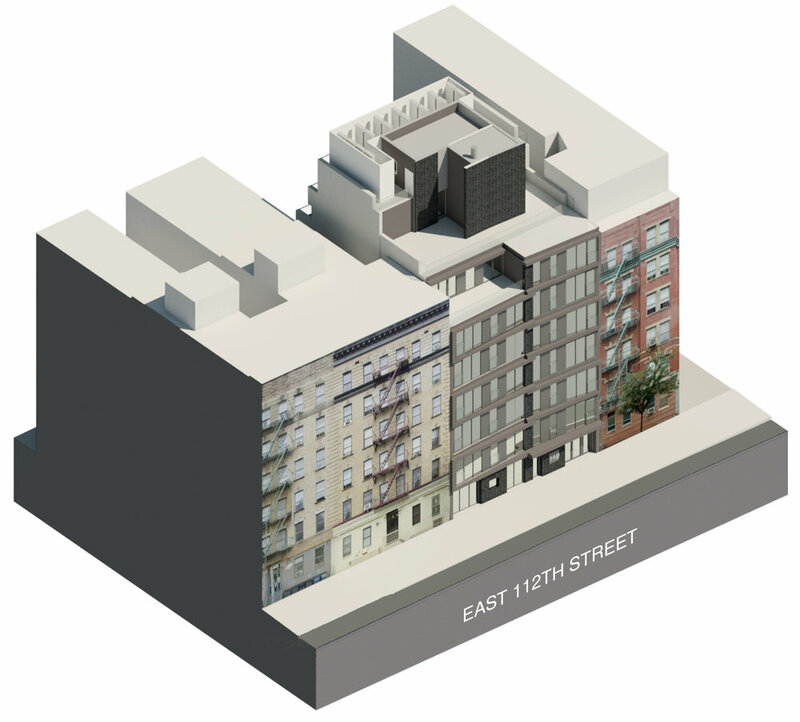 On the 112th street side, the building is integral to the block, with its weighty articulated skin, thicker on the first floor, The design strategy is very simple: the facade expresses the stacking of the pieces, but also groups the modules to showcase the breadth of the individual residential units, which feel like mini-lofts. The frames that outline the units on the two facades stem from a single Belgian brick pilaster that knits together the whole and identifies the public spaces and rear park access. The slender super-insulated windows, which recall the width of the windows of the surrounding buildings, alternate with the slate tone panels, reflecting the light in a varied way. The balance between solid and void is suggested by the use of the space behind, giving more privacy to the bedrooms. The garden South facade is more transparent, since the long balconies offer full shading during the summer to the large windows facing the open block-through garden.The ground floor benefits from a longitudinal lobby that connect the street to the common recreation space, the balance of the large rear yard is divided between the two duplex maisonette units. Like TRA's past projects downtown, this project addresses the best utilization of infill sites, the small but significantinterventions strategically contributing, like thestimulation points on a meridian channel network, to the revitalization of still emerging neighborhoods. TRA Studio has drawn up plans for a 22-unit condominium that will mend a once derelict site back into Manhattan’s taut urban fabric. 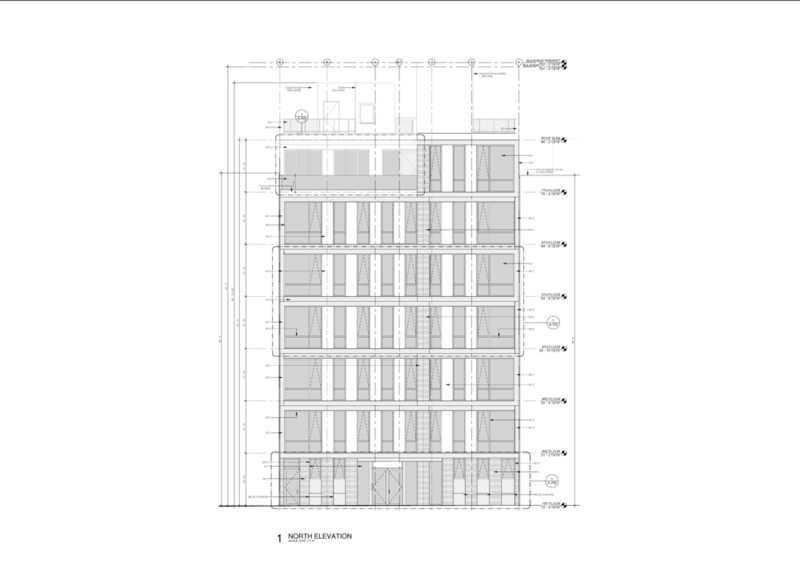 ..the seven-story building will rise from a 50-foot wide, 5,000 square-foot parcel that is a third smaller than a new American home’s median lot size..
One 112′s north elevation is bifurcated by a vertical column of grey brick that visually acts as the building’s hinge and separates each floor’s two street-facing units. According to Caterina Roiatti, Principal at TRA Studio, the vertical seam allows residents to easily identify their unit from the the outside. Each of the two asymmetrical faces pivot from the axis to create an ever-so-subtle folded facade. Floor slab areas are emphasized in an alternating and overlapping pattern that accentuates the pivoting effect and is evocative of the robust lintels and cornices of neighboring apartment houses. Six strips of slate-toned panels gravitate towards the center of the elevation where the more private bedrooms are located. Part of the seventh floor sets backs from the the floors below, offering the penthouse unit a terrace.